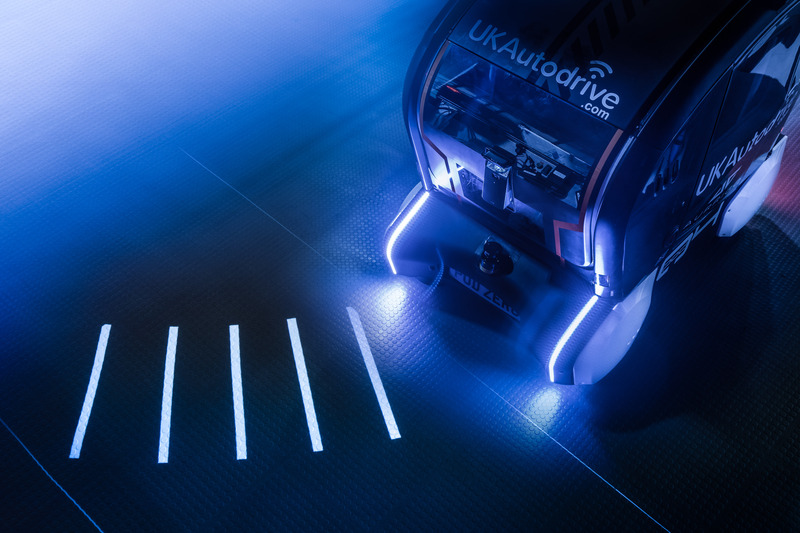 Jaguar Land Rover is trialling an alternative way to guide pedestrians and other road users as to where its self-driving vehicle is going, by projecting a light onto the ground in front of it. The British automotive firm has added the technology on autonomous pods developed by Aurrigo for the UK Autodrive project, which give people a better idea of what the vehicle intends to do. Bright bars are projected from the front of the pod, with the spaces between the bars widening when it moves off or accelerates, and shortening when preparing to brake. Should the pod need to turn left or right, the bars curve towards the relevant direction. Engineers have been testing the system on a fabricated street scene at a facility in Coventry. “Just like any new technology, humans have to learn to trust it, and when it comes to autonomous vehicles, pedestrians must have confidence they can cross the road safely. Last year, the pods were given virtual eyes, with the similar aim of improving the public’s trust in self-driving vehicles. The development comes weeks after Jaguar Land Rover announced it would cut 4,500 jobs under plans to make £2.5 billion of cost savings, with many of the job losses expected to be in the UK.